The first engine made by Honda, it ended with the prototype. 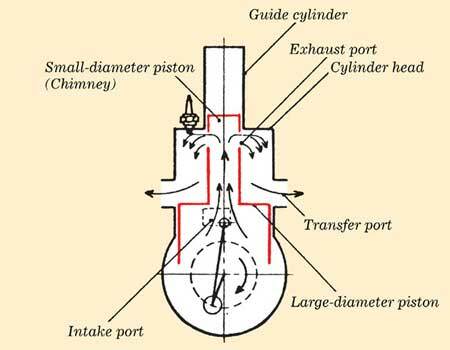 It is commonly called the “chimney” engine because of its unique design with a long projection on the end of the piston and the cylinder. President Honda thought up a thoroughly unique concept for a new engine, and showed it to Kawashima by “drawing it on the shop floor.” Crouching down and sketching out conceptual drawings on the floor was an unchanging habit throughout his life. The nickname given this engine–the “chimney”–still remains. As it suggests, both the piston and the cylinder head had a long protrusion on top, and there was an unusual central scavenging system, making for a most unconventional 2–stroke design. No such engine had ever been used on a motorcycle before. The aim with this engine was to minimize the disadvantages of the 2–stroke and to improve performance. In other words, it was supposed to reduce fuel consumption and raise power. However, development of this engine stopped before it was put into production. The machining tolerances and materials available at the time were simply not up to the requirements of this design and, apparently, the engine had been subject to one problem after another. Theoretically, this was a correct direction to take. However, it failed because it was too far advanced for its time. This is something that would happen time and again at Honda Motor Co. However, when Honda stumbled and got up again, it was not for naught. It is the Honda way to take the experience of failure and later use it as the fuel for future success.